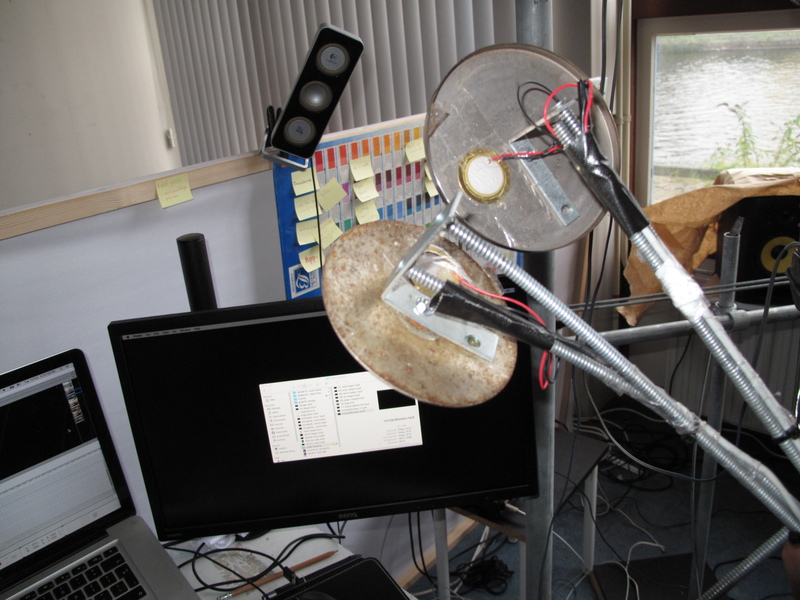 Big eyes as contact microphones, a bird cage as a loudspeaker, and two double spring objects of which one functions as a microphone and the other as a loudspeaker: this is the inventive set-up Erfan Abdi uses for his performance Points of Contact (2017). Erfan himself seems to be a bird, placed in the cage to perform for us, gently trying to break out by touching the bars with his metal eyes. The sounds during the performance are created by different combinations of the same set-up: both amplification as well as feedback through the contact microphones and tactile transducers are used. By using additional long springs the different elements can be connected to each other. 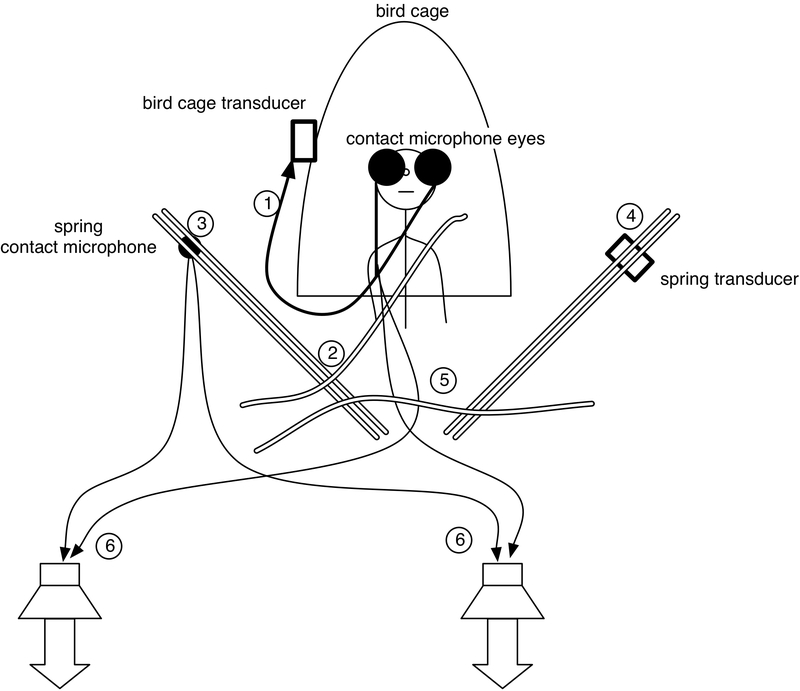 To give an example of one of the many possibilities for doing all kinds of physical signal processing with this set-up: a signal of the big eyes contact microphones is sounding through the bird cage transducer, and since both are touching each other a feedback loop occurs (1 in the scheme below). The bird cage is also connected with a spring (2) to the double springs with a contact microphone (3). 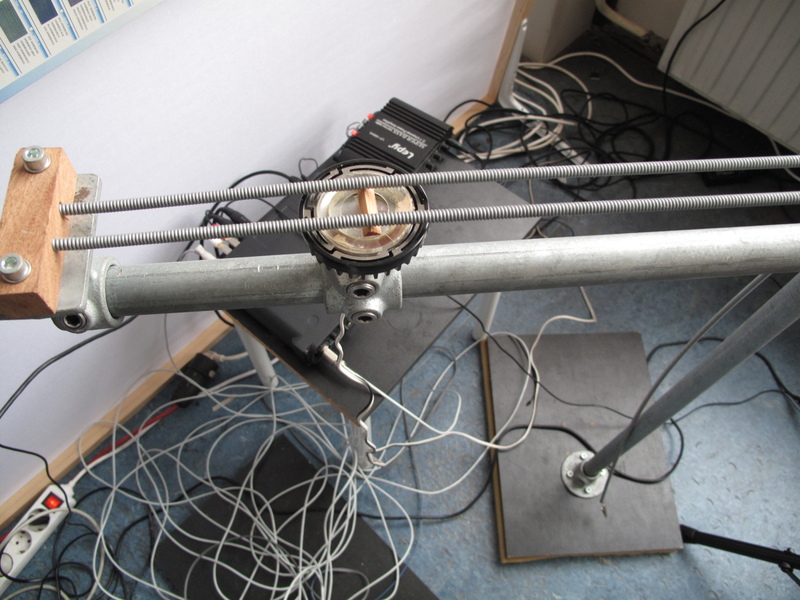 This is amplified through the transducer attached to two double springs (4). 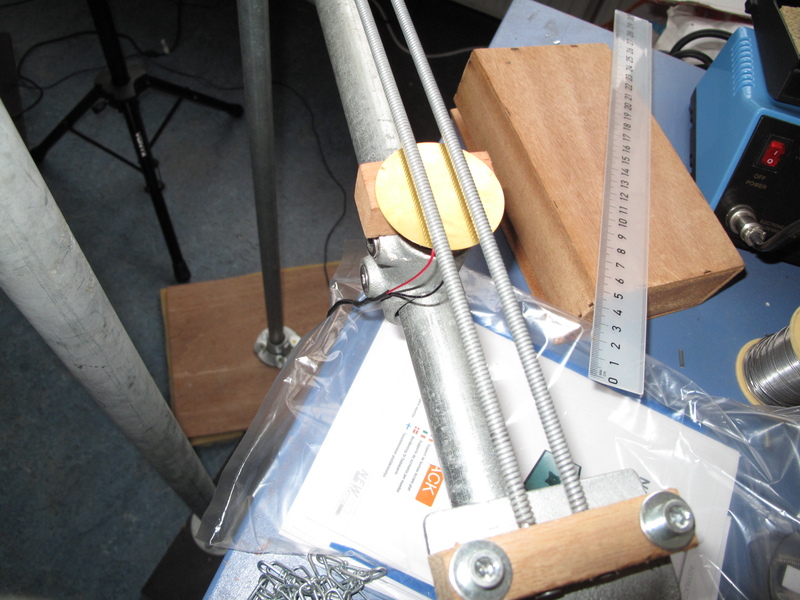 This is fed back again to the double springs with a contact microphone (5) by connecting the springs with the help of again an additional spring. 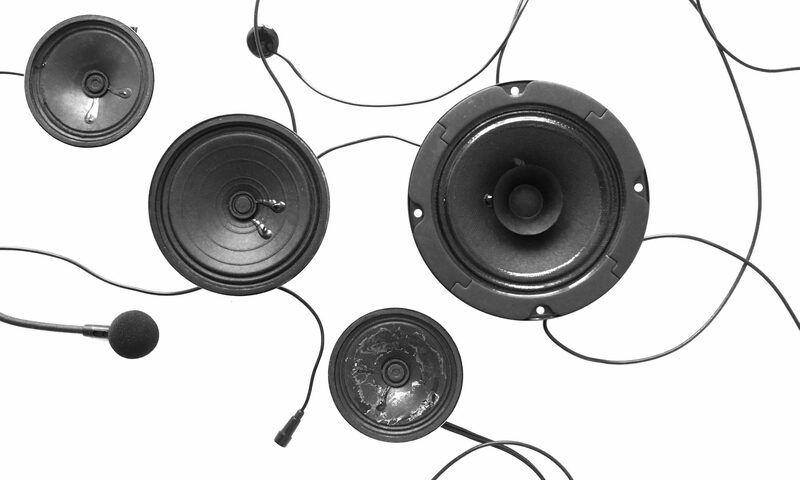 The sound of all contact microphones is also amplified by the two main loudspeakers in the hall (the PA system) (6). Set-up scheme for Points of Contact by Erfan Abdi, see the description above for a detailed explanation. What makes this set-up so versatile for producing all kinds of different sounds is that the two feedback loops can both be combined, influence each other, but also be broken up again (the first feedback loops are the contact microphone eyes and the bird cage transducer, and the second, the springs contact microphone and springs transducer). Take away, for example, the spring in between the two double springs—(5) in the scheme above—and the double springs become a spring reverb for the sound produced by the bird cage feedback. The whole set-up is constructed in the search of fragility and inaccuracy in response to the feedback signal. For this reason, the two contact microphone springs have been chosen by Erfan because their frequency response is slightly different: this results in a modulating feedback sound instead of a feedback on one constant pitch. For the same reason, the contact microphones eyes are made of simple piezo disks placed on round metal plates: this allows for the possibility of touching the bird cage at two or three bars. As Erfan explained me, when there is just one point of contact between the contact microphone eye and a bird cage bar, the feedback tends to be especially strong on the fundamental frequency of the pitch. 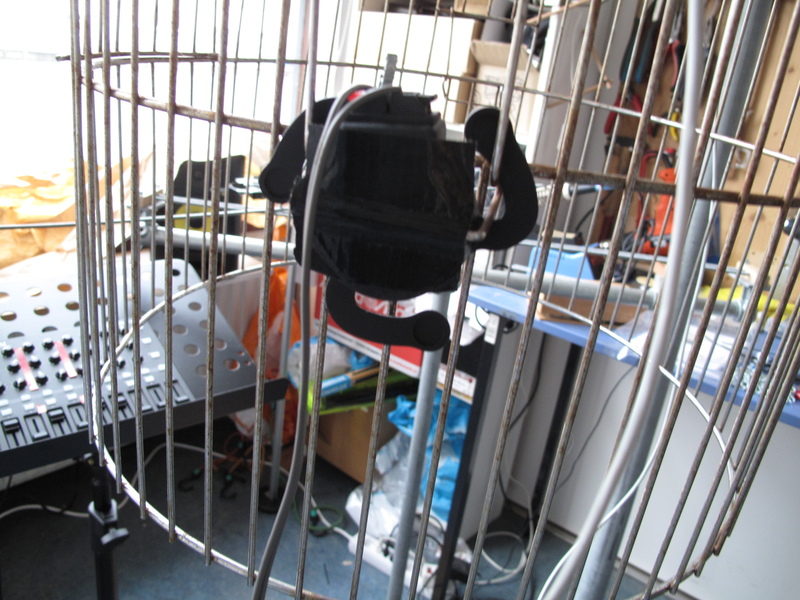 But as soon as you touch two or three of the bird cage bars, more partials are added to the sound. And by using two contact microphone eyes, they also start to modulate each other. The placement of the contact microphone below the two springs is, again, to produce a richer and less stable sound: instead of having just a single point of contact, the whole disk touches as much of the surface of both springs as possible. Erfan uses the music software Reason to do some processing of the feedback. Basically it provides a compressor, a delay line and an amplitude follower. The amplitude follower is used for modulating the delay time, so as soon as one frequency gets too loud, the delay is changed, and the frequency of the feedback will also change. The connections between the different parts of the set-up—which contact microphone is connected to which transducer, etcetera—is controlled live by Erfan with a small MIDI controller. 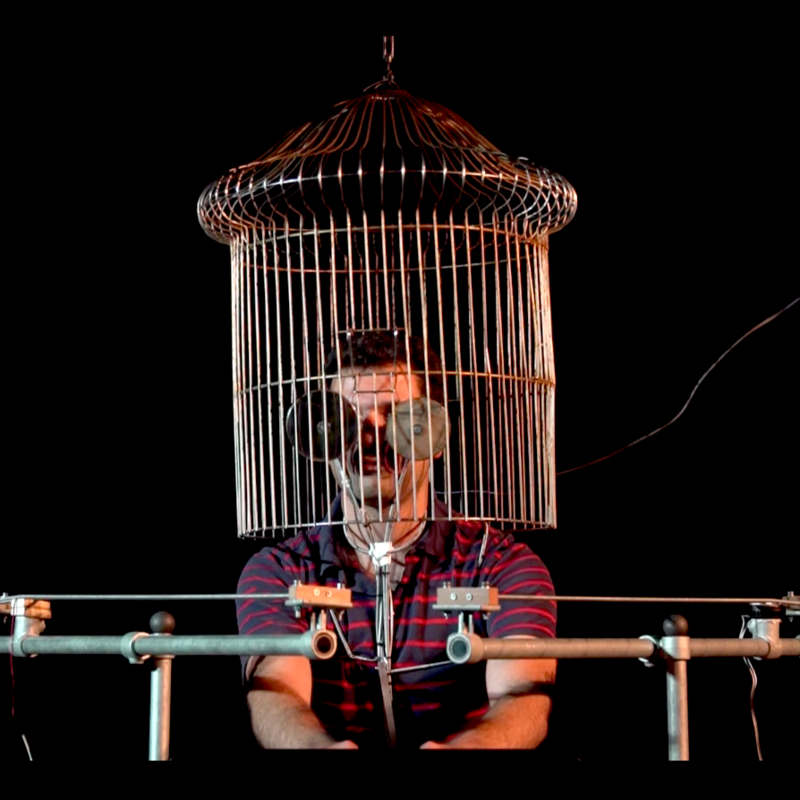 During the performance, Erfan sits in the cage, an intriguing image for a music performance. The movements of his head towards the thin cage bars seem to underline the scenery of a bird locked in against his will. But it is through the resulting sounds that this bird seems to be able to leave the cage: the variety of sounds not only enlarge the musical possibilities of this set-up, but also give the impression that the music can sonically fly away from the cage. The bird might seem to be locked in visually, but sonically, it is free to come and go. Below, you can view some short fragments of Erfan Abdi performing Points of Contact at STEIM in Amsterdam. And if you are close to The Hague: Erfan performs a new version of this piece tomorrow (Thursday 10th of October) at Ephémère at Studio LOOS.